Minutes ago, an e-mail arrived. Is there a Twins collector in the Baltimore area who wants to be on TV? CALLING ALL TWINS FANS AND SPORTS COLLECTORS LIVING IN AND AROUND BALTIMORE/DC! FROM THE PRODUCERS OF HISTORY CHANNEL’S PAWN STARS COMES A BRAND NEW NETWORK SERIES DEDICATED TO SPORTS FANS AND SPORTS MEMORABILIA! New network sports memorabilia series is currently looking for TRUE Twins fans living in or around Baltimore, MD for a special segment we’re doing for the team!!! In addition, we’re also looking for sports-related items that have historic significance and a great back story. If you or someone you know is a dedicated Twins fan OR owns a unique piece of sports history, we want to hear from you! Here’s a brief synopsis of the show…. Whether you’re looking for a Babe Ruth autographed baseball or an autographed Sidney Crosby worn-jersey, there’s no better place to find it than ROBBIE’S FIRST BASE in Baltimore, Maryland. A family-run shop, Robbie’s has built itself into a booming business and collectors, professional athletes and sports nuts can’t seem to get (or buy) enough of it. At Robbie’s, sports drives more than the family business; it instills a passion that brings out the best and worst in everyone. The atmosphere is akin to a sports barbershop, because when it comes to sports, everyone has an opinion. Every incredible item bought and sold at Robbie’s tells a story and prompts a sports debate, where both buyers and sellers spit stats and opinions like a sports radio show. When the item is right for the customer, all of the big arguments can add up to big dollars! Here is our casting notice…. “Do you have an amazing piece of sports history – a rare autographed baseball, signed stadium seats, or even a championship ring that you are looking to sell?? 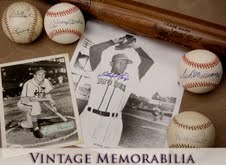 Are you a collector with tons of sports memorabilia or just dedicated fan with a gem? The Producers of History Channel’s Pawn Stars and American Restoration are bringing you the best sports memorabilia show out there!! I’d love to see an autograph collector on the segment, someone who could tell about making personal contact with former Twins. Someone who could tell the world that autographs aren’t just quantity, but QUALITY. Let us know how it turns out. We’ll be able to collect YOUR autograph!